As with cigarettes, there was a lengthy period of time when people had no idea that the rays emanating from our bright yellow sun were dangerous. However, as was so often the case while the 20th century progressed medical science gained more and more knowledge about the subject. In addition to seeing the discovery of penicillin, the dark reality of tobacco use and the end of Polio, it taught us that a simple sunburn could potentially, ultimately, end our lives. Does all the Data About Skin Cancer Help? Unfortunately, having that crucial information doesn’t seem to be helping. In recent years, countless organizations and philanthropic individuals have been working tirelessly to educate the public about the dangers of tanning and excessive unprotective sun exposure. However, new statistics seem to show that we’re all trying to bail out the Titanic with a thimble. The cited source The Cut article linked below referenced a recent (2017) skin cancer report published by the prestigious Mayo Clinic. The data within was confined to the first ten years of the 21st century, 2000-2010. These are very frustrating figures. At no time in history has there ever been more excellent, readily-available information on the risks of those harmful UV rays, yet that hasn’t helped to stop the explosion of skin cancer cases. We’ll of course continue our efforts, but we could all really use your support. Not money; just a very little bit of your time. If you’re reading these words, please help us spread the word on the importance of sunscreen use and other effective sun-safety techniques. 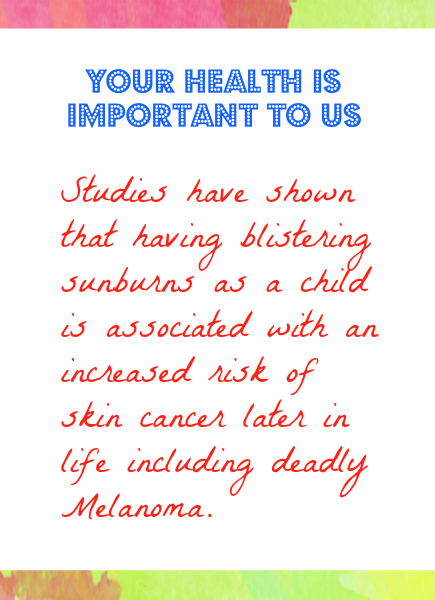 If you’re a parent, absolutely talk to your children about sun-safety. Long after they’re healed and forgotten, sunburns sustained during youth can manifest years or even decades later as skin cancer. Our DNA never forgets them even if we do. Please, help us to help prevent you and others from adding to these awful statistics. A Shot Please… Of Sunscreen Of Course!